Kayaking - Learn to kayak on Lake Bled or take a guided excursion with an instructor, Bled is the perfect place to learn how to paddle. Hiking - There are so many hiking trails around the area that you could dedicate your holiday exclusively to that! Day trips include Bohinji where you can take the gondola to the top of the mountain from where there are some good marked trails, and the beautiful Vintgar Gorge. You can also stay the night in a mountain hut. Horse riding - Experienced riders can go horse trekking, others can try it our for the first time. Fishing - Salmon, grayling and rainbow trout can be found in the waters of the Sava Bohinjska River. Summer sledging - The tobogganing run on the Straza Bled ski slope is great fun for families. Take the chairlift to the top of the slope then toboggan down the 520m track at up to 40km per hour! Family adventure park - The Pustolovski adventure park, again at the top of the Straza slope, offers 5 different tracks for all ages and abilities starting from age 4! Swing and climb through the trees, brilliant fun for all. Boat trip - Take a traditional Pletna boat ride across the lake to the island or hire your own rowing boat and spend a morning or afternoon exploring the lake. There is also a 6 km trail that circles the lake, perfect for a family bike ride! Mountain biking - whether you are looking for easy forest trails or challenging single tracks you will find something to suit your level around Lake Bled. White water rafting - go rafting on the Sava Dolinka River, no experience necessary and lots of fun! Canyoning - there are a number of canyons around the area that can only be explored by rappelling, abseiling and jumping, for more info on this activity have a look at our introduction to canyoning. Paragliding - Try a tandem flight with an instructor and see the lake and its surroundings from the air – blissful! Bled castle - Hike up to the castle to enjoy the fabulous views over the lake and visit this fascinating castle that dates back to 1011. There is also a printing shop, wine cellar, forge and a restaurant where you can enjoy those amazing views. There are many cultural events organised over the summer so make sure to find out if there is anything on during your stay. Bled island - The instantly recognisable island in the middle of the lake upon which sits the 17th century church of the Assumption. While it is possible to swim there, if you want to visit the church then take a trip on a traditional wooden boat called a 'pletna'; after climbing the 99 steps up to the building visitors can ring the bell in the clock-tower 3 times to make a wish. Ljubljana - Many people take a day trip to Bled from Ljubljana, but we think the opposite is worth doing! Around ½ an hours’ drive from the Lake, the capital of Slovenia is a charming city full of green spaces, museums and buzzing street cafes. If you haven’t had your fill of castles then check out Ljuljana castle, a medieval fortress which can be reached by funicular train from the town centre. 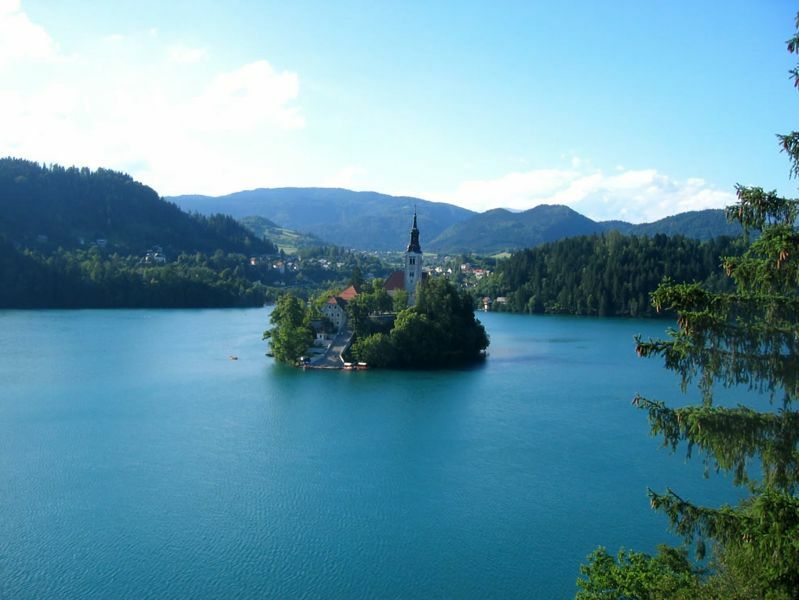 There is plenty to do for everyone in and around Lake Bled in the summer. But did you know that skiers can return in the winter to discover the various resorts in the area, Vogel, Krvavec, Kranjska Gora and Soriska Planina, as well as the slope at Straza overlooking the lake itself? Discover our great value ski breaks in Slovenia. You can find a full list of all our summer and winter Lake Bled holidays here. Have you been to Lake Bled at any time of year? Any tips or comments? We’d love to hear from you in the comments below.